Wanxin Zhang’s sculptures are born of the collision of disparate social movements and their attendant aesthetic innovations, brought together by the happenstance of the artist’s life and personal inclinations. Colliding elements include the Chinese Great Proletarian Cultural Revolution (1966-1976) and its ubiquitous propaganda, the harsh dictatorship of Qin Shi Huang (259-210 BCE) which produced the famous life-sized terracotta army, and the 1960s and 1970s American counter-culture movement, one of whose products was Funk Art. Such an unlikely combination of influences coalesced in Zhang’s oeuvre not long after his 1992 move from his native China to San Francisco. The result was a highly individualistic body of works that employ sly humor to undercut imperatives to conformity, whether dictated by historical megalomaniacs, or by modern culture. As a student in the Department of Sculpture at the Lu Xun Academy of Fine Arts in Shenyang, Wanxin Zhang followed a rigorous five-year course of study that focused on figural realism, emphasizing the use of clay. Following graduation, Zhang favored working with metal, but he returned to clay upon arriving in San Francisco and being exposed to the works of such clay artists as Peter Voulkos (1924-2002) and Robert Arneson (1930-1992). The former founded the California clay movement with his large-scale, rough, obviously hand-shaped works, and is credited with giving clay, “previously regarded as restricted to the realm of craft, a working vocabulary for use in freestanding sculpture.” Arneson, a leading light of the Bay Area Funk Art movement, imparted a funky twist to clay, producing works that were humorously anti-establishment—not only in terms of their overt subject matter, but also in their irreverent stance against the art establishment which favored “serious” modes such as abstract expressionism. 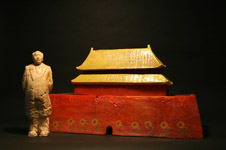 The result was that “when Funk merged with Arneson’s brand of narrative it catapulted the sculptor outside the framework of the other clay practitioners.” The Bay Area Funk clay movement inspired Zhang to return to clay and experiment with expressing his personal experiences of historical forces in brash, large-scale works infused with humor. As his career has matured, Wanxin Zhang has developed an ongoing major series of works that fall under the umbrella title of Pit #5. The signature image from this series is that of a standing figure modeled after the terracotta warriors that were discovered buried in pits adjacent to the burial mound of Qin Shi Huang, near Xi’an. Four pits had been constructed to house the emperor’s army: Zhang’s Pit #5 follows on from there. While free-standing clay sculpture may have been a novelty in terms of later twentieth-century art, the discovery of Qin Shi Huang’s terracotta army showed that it had flourished two thousand years ago in China. The tomb sculptures were discovered in 1974; Zhang visited the site in 1983, catalyzing for him the revelation that the first emperor of Qin, as a dictator who employed art as propaganda, was a historical precedent to Mao Zedong. Zhang compared the megalomania of a tyrant who would divert untold labor (that of up to 700,000 men) to the creation of a tomb complex that would glorify him in the afterlife, with that of Mao, whose image was ubiquitous during the Cultural Revolution: literally billions of his portraits were produced in the form of sculptures, paintings, posters, buttons, tapestries, and so on. Qin Shi Huang is credited with destroying knowledge through the execution of intellectuals and destruction of books that were counter to his interests; Mao Zedong was responsible for death and destruction on an even grander scale, and Wanxin Zhang finally fully understood this upon viewing the terracotta army. Like the figure standing against a target, Zhang’s freestanding figures also merge Red Guard with terracotta warrior. They have left youth behind, and their demeanors suggest disillusionment. They are ready to fight for neither the protection of Qin Shi Huang in the afterlife, nor for Mao’s ongoing revolution: the expectations placed upon them seem to have exhausted them. In a sense this is heartening. Unlike the terracotta warriors, who may appear to represent individuals but were assembled from endlessly recombined molded variants of different body parts, and unlike the Red Guards, who surrendered their individualism in favor of mass hysteria, these men appear to be individuals shaped by time and experience. If society can learn from experience, too, then there is hope for the future. That Wanxin Zhang serves up these complex ideas surrounding societal control with a touch of irreverent humor renders them all the more powerful. He leads his viewers to the realization that past, present, and future are interrelated, and the legacy of the past must be understood for the sake of an unencumbered future. I absolutely believe that " revitalization" of artistic concepts through the past, present, and future is a very challenging task. Regardless of the cultural implications, space, and time between these acts of recreation, one must also keep in mind that art is not the only motivation behind them. More importantly, the spirit and content of today’s society is the true source of these attempts. I grew up during an extremely chaotic time in China’s history, the politics in the 1960’s to 1970’s was more than just propaganda. The invisible brainwashing of the people to believe that Chairman Mao was their one and only leader, almost a deity was strong and undeterred. Thus, when I visited Terra Cotta Warriors of the Qin excavations – I immediately saw the similarities between these two societies. The feudal society of the Qin Empire demanded absolute obedience and submission to the King, an idea clearly reflected by the hordes of warriors in the pits. Yet thousands of years later, in modern China, this same oppression of the people is still alive and strong. It was that moment that I had the immediate inspiration to recreate these warriors and through an artist perspective. Since I arrived in the United States many year ago, I was presented with an environment to voice my ideas and thoughts through my art. For someone with my background, this privilege is invaluable. With my new surroundings, including my connection with Christianity, influence from famous Bay Area funk artists, and the contemporary American artist society , this became the perfect birthplace for my attempt to re-conceptualize the warriors’ lives which is a serious subject matter with sense of humor. It was during this experience that I truly realized the challenge behind this attempt. Not only have I been able to constantly test the limits to see how far we can go with clay, also have to push myself to see how I can truly incorporate my purpose, inspirations, critiques, and reflections to convey contemporary message. My art now is not just a reflection of the appearances of the original warriors, but also include in them a new sense of spirit and meaning. After all, the Qin Terra Cotta warriors are history to us now, but my warriors could be history to generations after us.